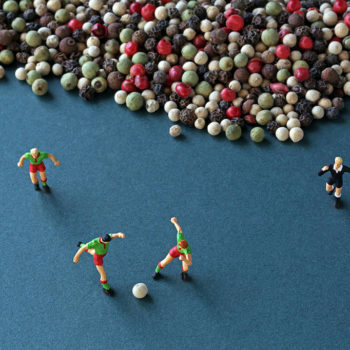 Christopher Boffoli’s photography series combines miniature, hand-painted figurines with staged arrangements of food and beverages to create clever vignettes. 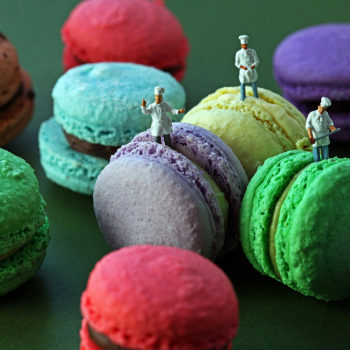 Inspired by an unusual combination of magazine food photography and the 18th century fable “Gulliver’s Travels,” Boffoli explores how inverting the proportions of people and their surroundings creates unexpected points of interest. These creative scenes evoke an uncanny likeness to the world at large. Boffoli also uses language to enhance the photographic narratives by selecting tongue-in-cheek titles that draw on old adages, colloquial sayings, and witty repartees, adding another level of interest to the work. Christopher Boffoli is a Seattle-USA-based photographer, artist, writer and filmmaker. With a background in literature and writing. Boffoli has traveled the world, setting foot on six continents, writing and photographing his travels through documentary and editorial photography and video. Christopher Boffoli’s work has been published, online and in print, in more than 80 countries around the world. His photography can be found in galleries and private collections in Canada, the US, Europe and Asia. 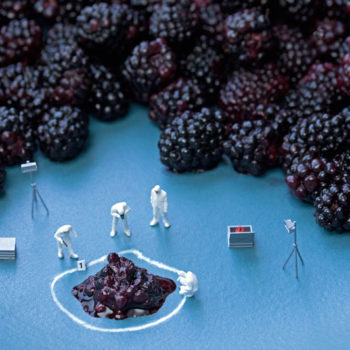 Blackberry CSI in Embark Magazine, Fall 2016. Designed by Andrew Gath.